Cell phone service will be getting better on Washington DC's metrorail system soon. Instead of just Verizon, there will be service from Sprint, T-Mobile, AT&T, and Verizon. Also coming access to the internet and wi-fi. Twenty underground stations will have expanded coverage by the end of this year and the whole system will be finished by 2012. That is good news for riders, but there is good news for metro too. They will get a second network for its operations for free and will get a minimum of 25 million dollars during the 15 year contract. WMATA: Metrorail wireless service to expand. 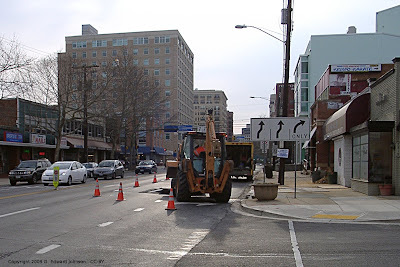 Old Georgetown Rd in Bethesda, MD will have 1 lane closed Westbound (Northbound really) between Glenbrook Rd and Auburn Ave (where the Exxon station is in downtown Bethesda) on Monday and Tuesday March 2nd and 3rd (2009) between 9am and 2:30pm to repair a gas pipe. 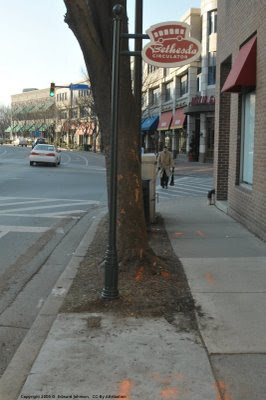 Update 3/5: The road work was rescheduled for March 4th and 5th. I didn't check to see if they are actually working on it now. Around 8:30 this morning they closed two of the southbound lanes of Old Georgetown Rd between Cordell Ave and and the Wilson Ln/St Elmo Ave/Arlington Rd intersection. It wasn't like it was emergency work either, they were pulling up some steel plates to continue earlier work. 8:30 is too early for this kind of work, it created a huge, slow moving backup. It looks like this is part of an ongoing project, don't expect them to finish it off this morning. Update 3:10pm: They have finished work for the day so it won't have an impact on rush hour. Montgomery Mall and Wheaton Plaza (Westfield whatever) are shortening their hours as of March 1st. They will now open at 10:30 on weekdays instead of 10am and close at 9pm instead of 9:30. Saturday hours are 10am to 9pm (instead of closing at 9:30) and Sunday is unchanged at 11am to 6pm. It seems the slowing economy is getting to them too. When I decided to go down to College Park, MD and see the unranked Maryland Terrapins play the 3rd ranked UNC Tar Heels I thought it would be a good game. 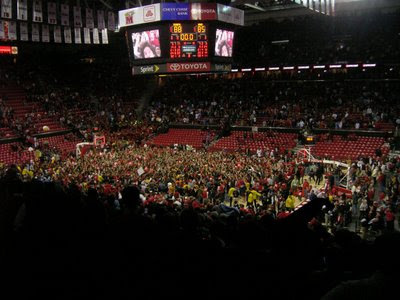 I didn't think the Terps had much of a chance of winning. The first half of the game did nothing to change my mind. The Heels got the first score and led for all but a minute or two. The halftime show featured a local dance/twirl team who just happen to be champions. I think it was Wheaton Dance-Twirl but don't recall exactly and it doesn't look like they have updated their website in over a year. 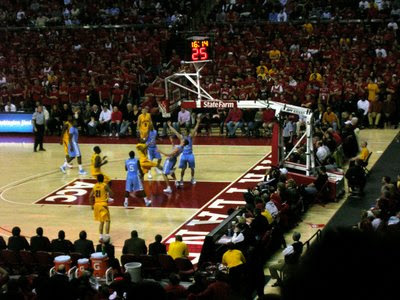 The second half was much the same, with UNC slowly opening up the lead from 10 to 14, even 16 points ahead. Then something happened. Not sure exactly when, but UMD started tightning things up. When there were a couple of minutes left I suddenly realized that Maryland had a real chance. Then overtime, man that was close. Overtime took for ever, lots of timeouts and a few fouls. I thought it would never end. When there were 5.9 seconds on the clock, with Maryland up, the seats were clearing out. All the college kids were moving down into the aisle so they could rush the floor when the game ended, I still wasn't convinced who would win. Fortunately, they weren't dissappointed, MD won 88 to 85. Shine silently has a post about this game with some good pictures, including one that was taken a fraction of a second before one of mine from a similar angle. What are the odds of that? The hand-carved wooden seat back read "Good that ice, or I'd have missed Feathered down clouds, orange and pink Curved across the windshield." and is valued at over $2,000. What is this, the third time in a row we have had a little tiny bit of snow then it turns to rain or dries up? Is it too much to ask that we get a good few inches of snow every couple of years? The snow should be over for the day, maybe some sleet but changing to rain by the end of lunch time. Rain for the drive home and tonight. Tomorrow a slight chance of snow and/or rain. Friday should be sunny again. In general, I am in favor of using appropriate words and not dumbing things down to a 4th grade reading level. Treat people like humans, not like idiots. 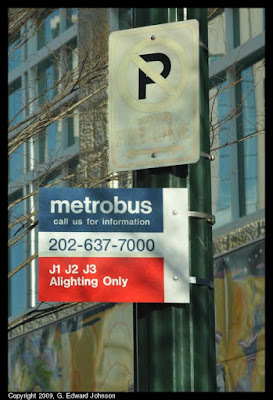 I'm not sure I would use bus stop signs in this way though. 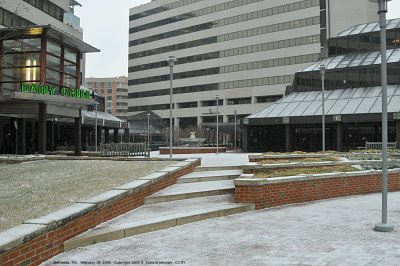 I saw this metrobus stop by the Discovery Channel building in Silver Spring, MD. I have to admit, I wasn't 100% sure if alighting meant getting on or getting off, and that is a critical distinction in this case. I'm sure I would have figured it out the first time a bus passed me by. The larger question is what would be a better word or phrase? It has to be short, unambiguous, accurate, and (at least mostly) correct english. "Getting off only" would be humourous, "This stop is for people to get off the bus and not for picking up people" is a bit long. Maybe "Dropoff only" or "No pickups"? 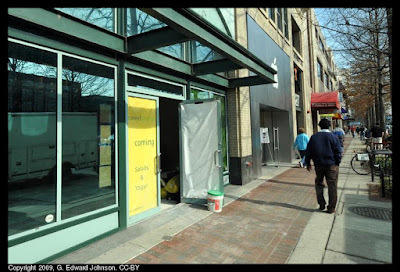 The new Apple store on Bethesda Ave in Bethesda, MD is coming along nicely. They have gone into a "stealth mode" putting a two-story plywood facade on the entire store so you can't see what is going on. At least, that is what I think it is for. I hope it isn't some sort of "plywood chic" design astetic they are going for. I first posted about this back in December. I previously talked about the bad news, but there is good news too. First, there is often retail turnover in the new year, all the stores who didn't have as good a holiday as they hoped close and new ones take their place. 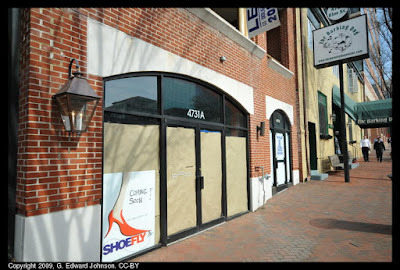 I found a few "coming soon" signs on Bethesda Avenue and look forward to checking them out when they open. This type of renewal is common and it is encouraging to see this many soon to open stores. Replace any gas pumps lately? I don't see this very often. 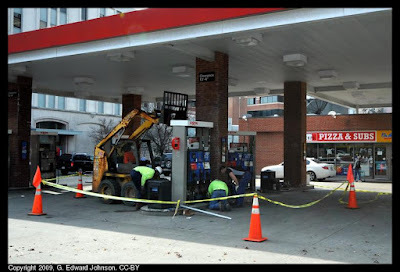 They were either repairing or replacing some of the gas pumps at the Exxon at the corner of 355 and Montgomery Lane. They had picked one up completely and were working on another one. The poor economy is starting to take its toll on Bethesda. 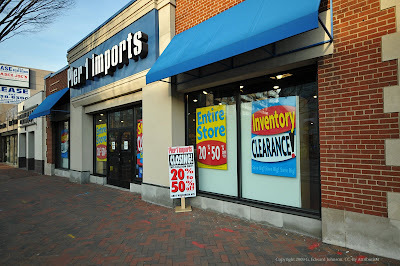 I previously mentioned the Pier 1 Imports closing, but that is not the only casualty. There are also a couple of other stores closing including Maurice Villency which has a really hard to read sign so probably was filled with high-end something or others and Hadji rugs. These rug stores are constantly going out of business, usually they are replaced by another rug store with pretty much the same stock, so it is hard to say if this one is economy related or just the normal course of business. I also noticed in the same area as Pier 1 there are a bunch of kitchen and bath and related design stores. 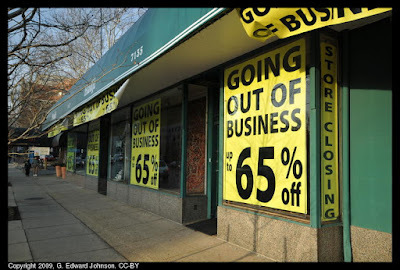 I'd expect these to be hard hit by the recession, don't be surprised if they start closing soon. 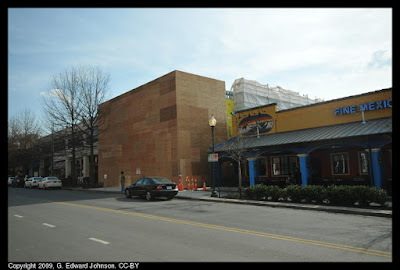 I went down Bethesda Avenue to see how it was doing. I found a bunch of stores missing. 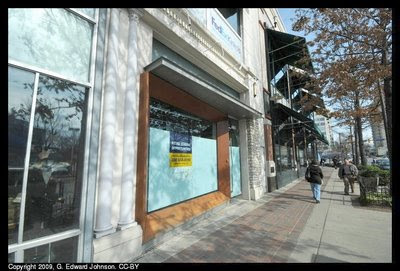 Artsy Fartsy (4836 Bethesda Ave.) is gone but there is still furniture in the store. Bowhe and PEaRe is closed with no replacement (4803 Bethesda Ave). 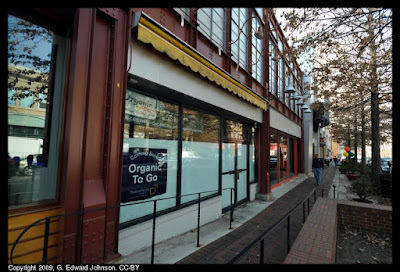 Also gone are Marvolous Market, and Cameron's Seafood Market. Life isn't all bad news so stay tuned for the good news edition. There are ads everywhere these days. I ran across this one in the elevator. 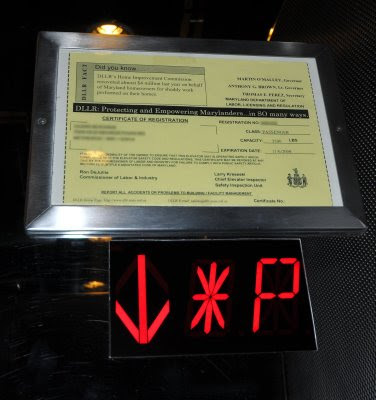 The insidious thing about it is that it is the elevator inspection certificate issued by the Department of Labor, Licensing and Regulation. The upper left corner has a "did you know" section that talks about how much money the home improvement commission recovered for shoddy work. If the state makes you put up a sign, it should have an ad on it. (I was going to put the text of the ad in, but then decided if I were complaining about the ad, it wasn't a good idea to more widely distribute it. Enlarge the image if you want to see it.) I also like how the certificate number is missing. It's always welcome when we get unexpectedly nice weather in the middle of the winter. Today was sunny in the mid 60s, I hope you got a chance to go outside. 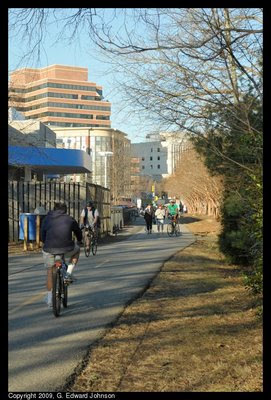 I went for a walk on the Capital Crecscent Trail in Bethesda, MD and I think everyone else in Bethesda was also there. It was pretty crowded but everyone was enjoying the weather. Sometimes you need an off-beat holiday. Who thought it was a good idea to eat ice cream in the middle of the winter. If it was up to me, I would have made it in August when it was really hot. However, it isn't up to me so Ice Cream For Breakfast Day is the first Saturday of February. That's this Saturday. How do you celebrate it? Have ice cream. For breakfast! No need to make a sundae out of it, this year I am going to make pancakes and top it with a scoop of ice cream. If you have kids, they will love it, guaranteed. If you want to learn more you can read about it, but really, all you need to know is: Eat ice cream. For Breakfast. On the first Saturday of February. This should be pretty obvious, but someone thought it was worth writing a whole article about it. Here's the summary: We don't spend much money researching neglected diseases. Well, color me not suprised. If we were spending money on them they wouldn't be neglected would they? I was actually surprised at how much money is being spend on some of these "neglected" diseases. The related diarrhoeal illnesses had over 110 million spent on them in 2007, doesn't sound neglected to me. Another (non) shocker "investment decisions...may also be influenced by factors such as the presence of advocacy and fundraising groups". You mean people might raise money for a particular disease and want it to be spent on it? Who would have guessed. Overall, this article is notable only in its uselessness. The Gazette has an article about the importance of customer service to small businesses during the downturn. They mention a couple of Bethesda businesses, Coco Mio (clothing and accessories), Jaleo (restaurant), and Fancy Cakes by Leslie (baked goods). For Coco Mio, business is down 30 percent since last summer, but Fancy Cakes is hiring. I found an interesting site the other day, GoOut2Eat which has discounts for DC area restaurants. They just started posting ones for Bethesda, MD. They have some quick, lunch type places (such as Crossfire, Philadelphia Mike's, and St. Elmo Deli) as well as sit down nice restaurants (such as Jaleo, Gaffneys, and Thimian Thai). I tried out a coupon for Philadelphia Mike's yesterday, a dollar off a combo. 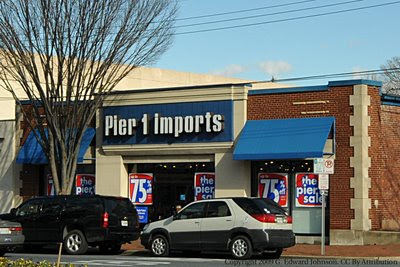 They also have discounts for a lot of resturants in Rockville. Now it is Restaurant Two-Weeks. It was supposed to end on the 1st but they have extended it thru February 8th. You can get a fixed-price two course lunch (either $12 or $15) or three course dinner ($25 or $30) at one of 30 Bethesda-Chevy Chase restaurants. The full list of participating resturants is available, please call ahead for restrictions and reservations. It's Groundhog's day and old Phil saw his shadow (I've heard he is right 48% of the time, it's like money in the bank). I'm still working on coming up with my groundhog's day resolution, but I am sure it will be along the lines of "Do something both useful and interesting this year". Most people don't make groundhog's day resolutions but I have been doing it for 5 or 10 years. It makes perfect sense. Do you know anyone who is still keeping their New Year's resolution in February? Didn't think so. But my groundhog's day resolution always lasts into February (sometimes even into late February). Plus, it kind of elevates this under appreciated holiday into something almost useful. Maryland State Highway Administration is (kinda) using twitter. for twitter (but better to have one for each county, not one for the whole state). For the inauguration MDSHA used twitter to give short updates about road closures and traffic. There are dozens of updates on the 19th and 20th, but nothing since. This type of service would have been great during the snow and ice this week, hopefully they will revive it. There's an interesting privacy twist to this. If you are one of the 187 people following them, then pretty much anyone can figure out you live in Maryland.